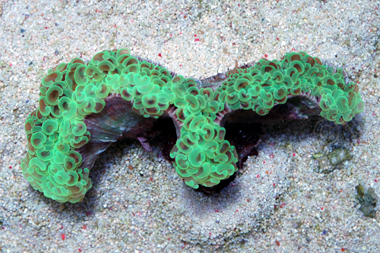 So order a few corals from liveaquaria.com, the hammer coral being one of them. He was shipped from a different location from the others, and was somehow sent to the wrong address. Luckily I have the UPS app and noticed this number was not tied to my address so I contacted UPS and sure enough it wasn't coming to me. I called live aquaria and asked if they could re-route it and while the lady was rude about it "Well I guess but its going to add a day to transit", it did get rerouted. Someone different called me back from them to tell me it was rerouted and did give a full refund for the coral. Its great they refunded it, but just seems so easily preventable with a live animal. Anyways, with that ranting over with, what is the likelihood this coral survives, anything I should look for or do? You should know when you open the bag. I would dip it and still put it in a low flow, low light area of your tank, if you don't have a decent QT setup. These corals are hardier than people thing. I have seen some even come back from skeleton state. Good luck. Take a few pictures and share them here once you get it. Maybe we can offer more help after seeing it. Thank you for the reply, I forgot to update last night, UPS was able to deliver it same day and seems to be pretty healthy, I'll try and snap a pic tonight of him if I can. Good to hear they aren't as difficult to care for. ( I have seen people say they are ) I'm newish to corals, but the ones I have are thriving to the point water changes aren't enough to keep my levels up and supplements are necessary. Good to hear. I want to clarify. There are two types of hammers. Branching like the first picture and Wall like the second picture. The Branching hammer is fairly easy to care for and a bit forgiving when it comes to fluctuations. On the other hand, the Wall hammer is extremely delicate and prone to infections if not fraged properly. That may be why people say that hammers are difficult. That makes a lot of sense now why I was seeing different pictures and thinking they looked not a whole lot alike, thank you for clearing that up. I do have the Branching it appears so that's good. My water parameters remain pretty constant with zero levels of ammonia/nitrite and very low nitrate ( under 10?, tests aren't that precise, but its same color every time ). I also use RODI water and have a Kessil AP700 so I think I've helped eliminate a lot of newbie ways of killing corals. Oh yeah, it looks good. Just keep it in one place for a few weeks to avoid making it angry. They don't like being moved around a lot. It looks like with the gear you have and your water parameters in check, you should have no problems keeping this and other corals for a long time. Good luck!